Desde su primera colección Liz Black ha tenido muy claro hacia donde va con su propuesta. A modo de una declaración, sus piezas evidencian formas poco convencionales y se afianzan a un estilo independiente de las tendencias pasajeras. No en vano, su singular enfoque le ha valido recientemente una nominación a los Scottish Fashion Awards (a efectuarse el próximo 9 de Octubre) en la categoría de Excelencia Creativa. In January it was announced that the Alexander McQueen show would be cancelled and a small presentation would take place instead, since creative director Sarah Burton is nine months pregnant with twins. This could very much explain why only ten looks were shown; and, taking into account the incredible craftiness and exquisite details of the collection this might as well have been an Haute Couture showing. It was pure ceremonial splendor, a majestic interpretation of ecclesiastic wear with a nod to Elizabethan times: rich white lace, pearl embroidered bodices and hoop skirts. Models' necks were wrapped in gorgets while diamond-patterned gilded cages enclosed their heads (they sort of reminded me of Fabergé eggs). While some of Burton's religious frocks looked by no means sinless, like the black short embroidered dresses paired with pearl-studded fishnets, for instance; they added up to the drama in contrast to the more angelical, lavish gold embroidered corsets with voluminous white skirts and ornate ruffs. Darkness and light, the pure and the the impure, lustfulness and innocence, were always part of the Lee's complex dialectic. Burton has not only summed up McQueen's heritage beautifully into a succinct, yet magnificent collection; like her mentor, she has evidenced once again her incredible ability for showmanship. 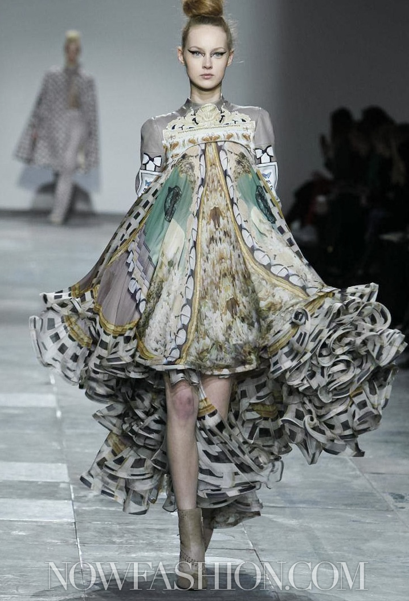 Giambattista Valli has proven more than once to be more than just a designer, he is a true couturier. This time around he managed to translate his skill swiftly into an easy, down to earth ready to wear collection that glided through masculine and feminine elements. 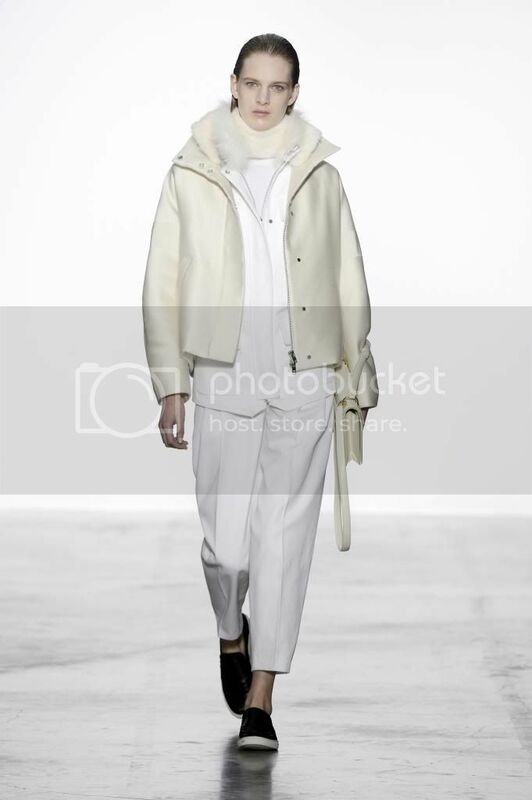 He opened with a series of white and cream looks consisting mainly of sporty jackets with furry collars over white outfits and draped chiffon skirts. He moved onto shinier fabrics and a group of black looks that included sweaters with holes placed on purpose; the only pieces in the showing that had a slight "punkish" appeal. 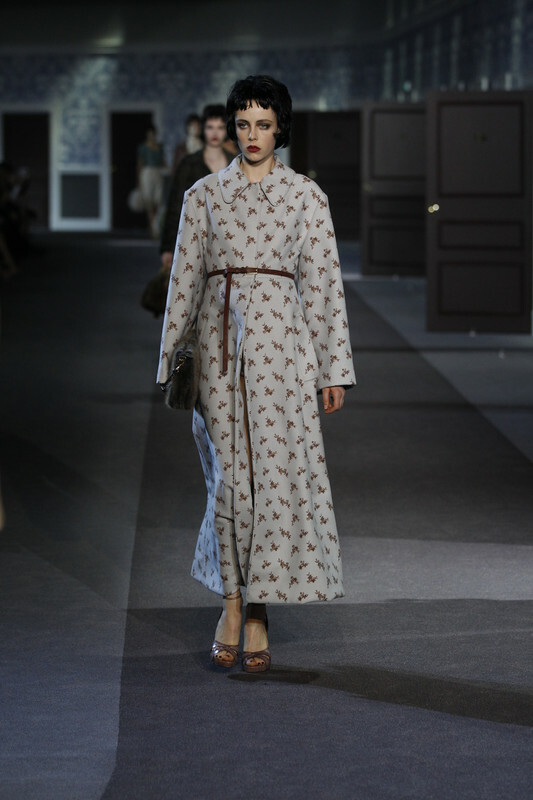 Fur was ubiquitous: trims, coats, vests and even a short evening black dress lined underneath with chiffon. In addition he turned to his usual animal prints combining them with black to create sheath dresses or a sweater and draped skirt outfit. Only a couple of looks sported a red over black floral motif print. Bright red, baby pink and pistachio green were also part of his chosen color palette. The show closed very much like it opened: a cream coat over a long chiffon dress, this time with a crystal-embellished neck. Talking about embellishments, Valli's love of decoration was unusually absent in this presentation; something which played very much in favor of the glamour and wearability of this outing. Philo has proven to be one of the most innovative and consistent designers of the moment, if not the most. 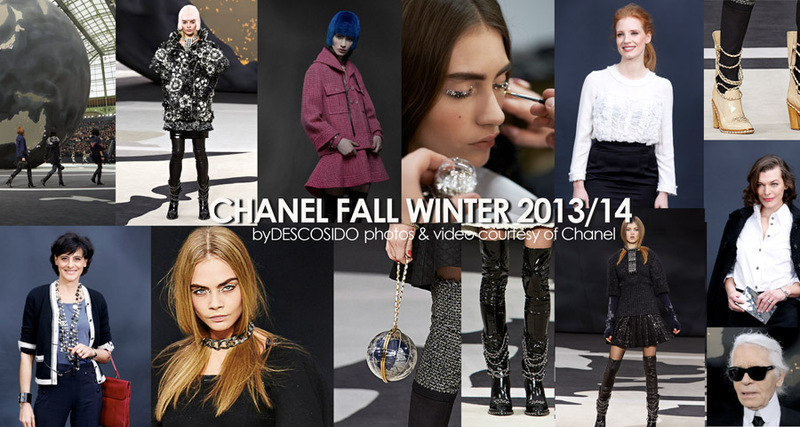 She delivers season after season elevating her game in every collection. This is without a doubt one of her best outings to date. Haider Ackermann is one of the true geniuses of this generation. He brings something fresh to the table season after season whilst staying true to his unique, androgynous yet feminine aesthetic. His exquisite choice of fabrics, use of colour, impeccable tailoring and unequivocal way of layering pieces capture the quintessential woman of today: powerful, cosmopolitan, multifaceted who can look exceptionally glamorous and be comfortable in her clothes (and skin) at the same time. Ackermann is always looking forward, there is not a hint of vintage or nostalgia in his offerings (ok, there was a very subtle nod to the 80s today); a huge advantage over peers who base their collections on recreating trends from 30, 40 and over 50 years ago. Fashion in general should move forward without looking back so much. 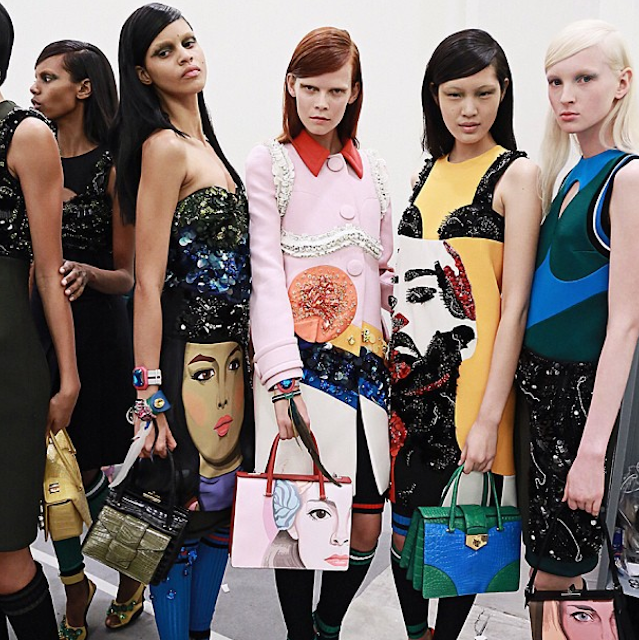 Prada manages to pull it off because she always makes it look so incredibly modern, so now. 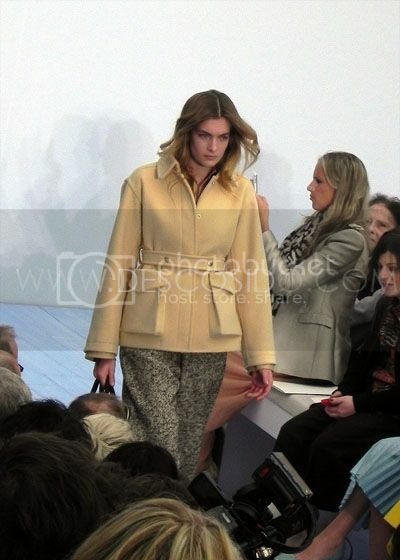 Today's show had outstanding outerwear that picked up on the oversize trend sneaking up almost everywhere this season. Fitted or loose trousers ruched over boots under oversize knits and jackets gave the sensation of a relaxed yet very elegant, luxurious style. The belgian-born designer is also a master in creating rich mixes of textures and colour and making them come together in an effortless way. This time around he opted for chocolate brown python leather, velvet, metallics, houndstooth, black leather, forest green and an ocasional black and white graphic print. He even brought in fur for the first time, making his closing look -a knee length coat thrown over an immaculately white pantsuit- a notable statement. 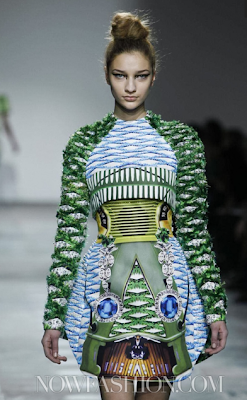 Mary Katrantzou just keeps getting better season after season. 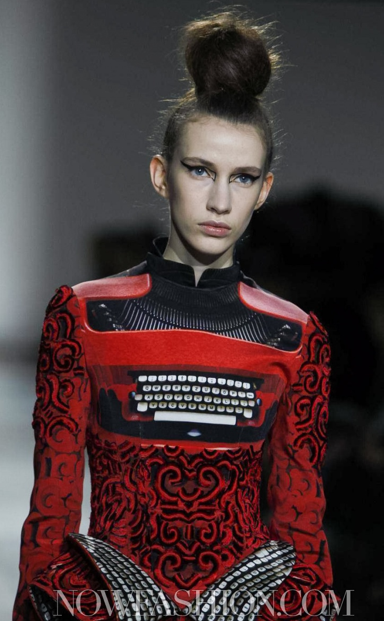 This time pencils, spoons, a french garden, watches and even a typewriter made it into Katrantzou's fantastic prints. According to the Telegraph the designer collaborated with French embroidery house Lesage to put together this collection, no wonder this is almost couture. Just when I thought I could not love Stella McCartney more, she does a flash mob presentation with one of her best collections yet. 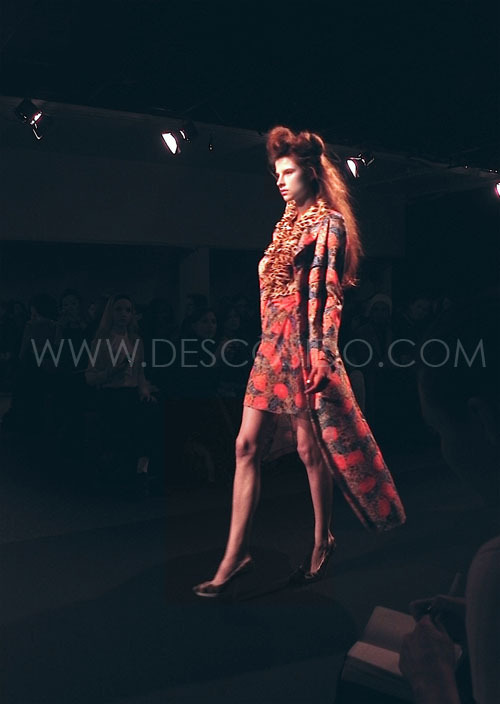 Sleek gold-belted column dresses and ultra bright marble printed pieces with voluminous proportions. The designer said that the clothes that were shown tonight are main collection and the upcoming show in Paris will feature main collection pieces as well. So, McCartney is basically doing two collections this AW12 season. Stella is a true innovator, she is the living wearable proof that high fashion doesn't need fur and skin to be luxurious and fabulous. To do fashion the way she does is to embrace a true creative challenge which all of the designers should be embracing too. Pensé que no era posible amar más a Stella McCartney hasta que vi la presentación a lo flash mob de una de las mejores colecciones que jamás haya hecho. Vestidos ceñidos con cinturones dorados y un estampado de mármol en colores ultra brillantes que daba formas voluminosas a las piezas. La diseñadora comentó que esta muestra es colección principal al igual que la próxima a presentarse en París en dos semanas; es decir, la diseñadora esta temporada tendrá dos colecciones. Stella McCartney es una verdadera innovadora, es la prueba que se puede hacer moda igualmente lujosa y espectacular sin pieles y uso de animales. Eso es un verdadero reto creativo que los demás diseñadores deberían asumir.